I’ve been thinking a lot about people in the world who go through life with little to no science education, and I feel really, really bad for them. I feel bad for the mother of the child with a cleft lip who is convinced that the child was born that way because she was out of the house during a solar eclipse. Imagine the kind of suffering she must be living through to think that she is responsible for something that was pretty much out of her control. All it takes is a little science for her to learn and understand that these genetic things happen, and that — except for smoking and some other drugs — there is not much someone can do to avoid them. If you watched the Nolan Batman Trilogy (“Batman Begins” to “The Dark Knight Rises”), you may have noticed a phrase that was uttered throughout. In “Batman Begins,” our hero is told to use “theatricality and deception” as “weapons against the uninitiated.” He was being told to use small explosions and smoke to distract his opponents and gain an advantage. He took that a step further and created the Batman persona in order to protect those he loves from retaliation when he went after the bad guys. As you can see, Batman wasn’t the only one using theatricality and deception. His adversaries also did, to deadly consequences. In “Batman Begins,” the League of Shadows releases a toxin to bring fear to the people of Gotham. In “The Dark Knight,” the Joker uses a lot of deception to play games with our hero and the Gotham City Police Department. And, in “The Dark Knight Rises,” Bane hides in the shadows and acts from within them, very patiently, until he stikes and holds the city hostage. There is a hilarious thread going on on Facebook right now between an anti-vaxer and a pro-vaxer. (Yes, I checked in with a few comments and explanations, but mine are just a small fraction of the comments.) 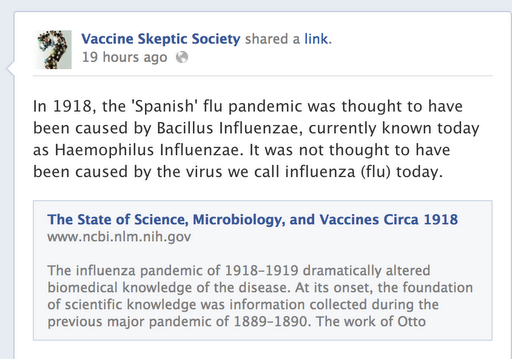 Go over and check it out before it gets deleted by the anti-vaxer. 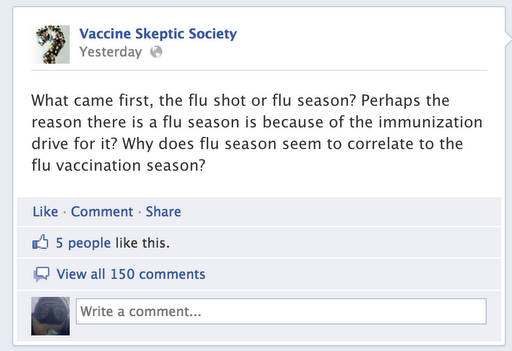 The anti-vaxer calls herself “Vaccine Skeptic Society” and a “non-profit organization”. Mind you, she is just one person, an at-home medical coder (per some conversations of hers on Facebook), and someone who is totally ignorant of science. Okay, maybe not totally ignorant, but she does come off as knowing nothing, absolutely nothing about science. It would be pointless to argue because she is a germ theory denialist. Anyway, if you want to have a good laugh at someone who is rabidly anti-vaccine and wants to come off as a scientist, go over to her page. Chuckle as you read her write over and over that she’s “just asking questions” and wants to have a “balanced” debate. This brings to the forefront the need for better science education at the elementary and secondary school levels. We really can’t get more people like the idiot above get out into the public, create Facebook pages alleging to be non-profit organizations (a crime) and “just ask questions” that lie and deceive unknowing people out of a safe and effective way to prevent deadly communicable diseases. Because, soon enough, some poor new parent is going to stumble onto her rants and get the wrong idea about vaccines, refuse to vaccinate their child, and lose or have that child injured by a vaccine-preventable disease. Oh, yes, it’s that important to learn science early and often. But you need a solid scientific base on which to base that research. Without knowing what you are reading, you are very likely to be deceived. You’re likely to believe the lies of the anti-science forces out there. You need to know what is scientifically plausible and what isn’t. For example, if you read a paper from an obscure source, claiming that homeopathy works, you will tend to believe it if: A) You desperately want to believe, and/or B) you don’t know how basic math and chemistry rules-out the possibility that homeopathy works. See, she thinks that rainbows are a sign that the water is contaminated. I bet it’s because she’s seen the sheen on water surfaces after oil or oil-derived compounds are spilled onto them. So, sure, do your own research, but make sure that you are educated in the things you are researching. Most scientific concepts are not easy to understand with a quick view via Google. You need to know what you are looking at, if it is plausible, and the science behind what you are observing. I’ll tackle the rest of that comment later, if I feel like it.